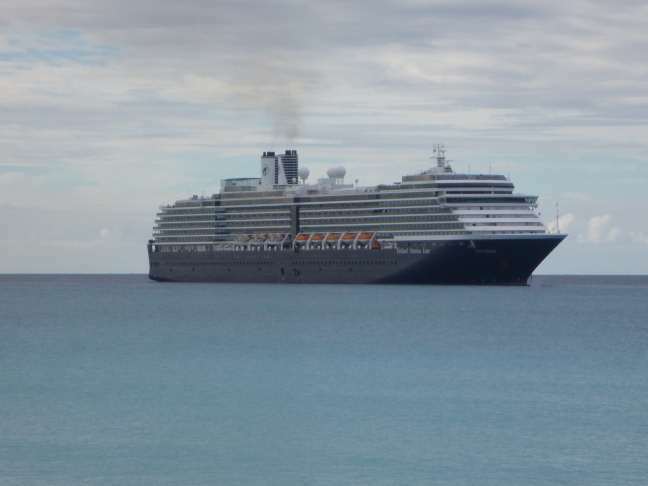 tradition, I suppose since this is HOLLAND America, not England America. 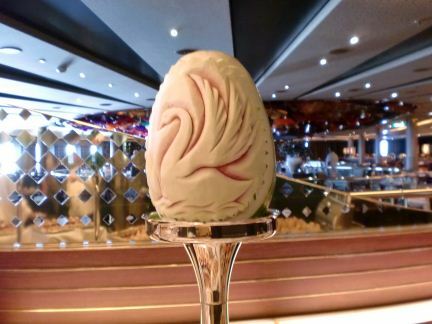 A windmill sculpted in ice greeted passengers on the approach to the high tea on the Westerdam. Luckily, the sea had calmed down a bit and the ship stayed flat, or it would have been high tea on the really really high sea. Probably would have been more than a bit messy too. Earlier the boat rocked enough to slosh people in the pool from one side to the other, much to their delight. A genuine wave pool. But that having nothing to do with tea, I shall move on. A crowd began to gather in front of the dining room, waiting for the doors to open in anticipation of High Tea. Through the glass we could see the fancy display of delicacies amidst decorations made of food. What to do until the doors opened? Other people stood patiently waiting. But that’s other people, I generally have no patience for waiting. So what did I do? Got out my camera of course. Within minutes an army of cameras joined mine, though mostly taking pictures though the glass, while my tiny Casio pocket camera fit nicely into the spaces between glass panels. I did see one or two other people try to copy my technique, but they were lucky if they could get the lens in the open space. There is definitely something to be said for tiny cameras. Finally a crew member dressed all in white opened the door. People flowed through in orderly fashion. 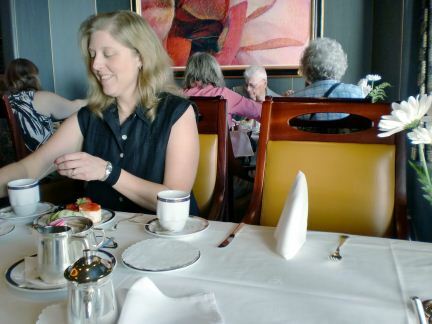 Not too quickly, lines move a bit slow in the early days of a cruise as passengers are not allowed to serve themselves for the first few days to halt the spread of any germs they may have boarded with. Delicately carved watermelons atop poles, and bouquets of sugar flowers adorned tables overflowing with numerous fancy treats. What to pick? I tried a cucumber sandwich, about as traditional a tea treat as I have ever heard of. A cream puff swan and tiny chocolate cake joined the sandwich. What is that hollowed out flakey biscuit thing? Does the soup go in it? Yes, OK I’ll try one of those. I might have been a bit greedier if it was serve yourself, but that seemed like enough for point at the food you want and somebody puts it on your plate service. A good way to keep from putting on those extra cruise ship pounds as well as halt the spread of germs I think. alone. Apparently John wasn’t the only absent husband, having chosen poker over tea. I sat with several other women and we all had a nice chat with our tea. We pulled the large chunks of butter out of our sandwiches and ate the rest. The biscuity thing tasted pretty good too. 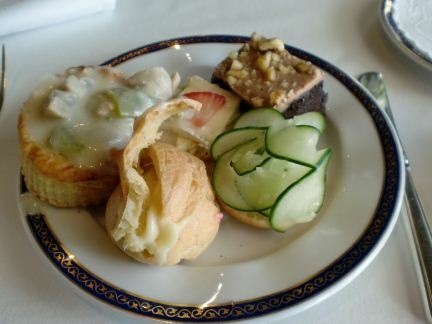 High Tea on the High Sea, a pleasant way to pass an afternoon on the ship. 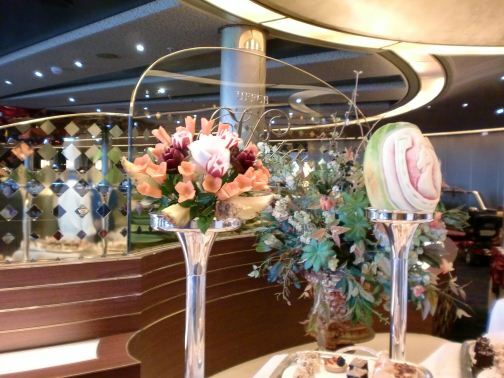 Later in the cruise they had some specialty teas, including the ever popular cupcake tea. With so many other things going on, this turned out to be the only tea I made it to. Better for the waistline that way I guess. The comic who joked about cruise ship passengers having 14 meals a day was probably not all that far off for some people. 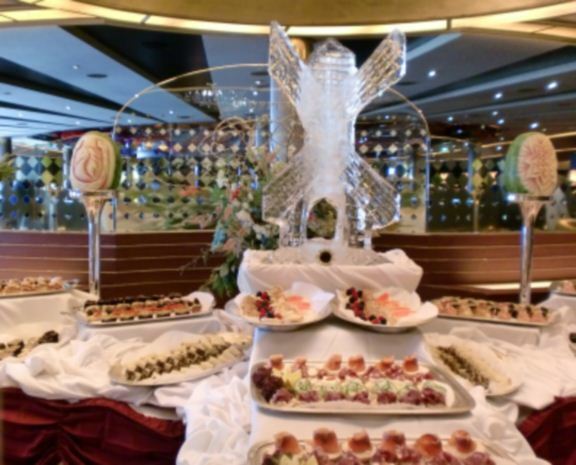 The seemingly endless food options is definitely one of the things most people enjoy about cruises. This entry was posted in Cruise Food, Holland America, Westerdam and tagged afternoon tea, Caribbean cruise, carved watermelons, cruise food, High Tea, ice sculpture, vegetable boquets. Bookmark the permalink.